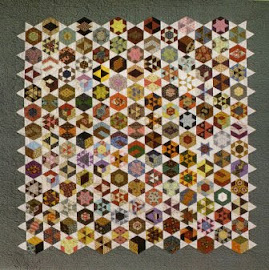 PENNYLANE PATCHWORK: Hanging a quilt! I hate having to add a hanging sleeve to a quilt, especially long after it's been bound. Adding the sleeve during the binding process has so many advantages. Well I have had to add a sleeve to my 'Reminisce' quilt today. Designed by one of my favorite designers, Lori Smith, this quilt was the perfect size to hang in my new hallway. I was restricted by the fact I had to use the existing picture hooks, I cannot remove or add any in our rented home. After attatching the sleeve to the back of the quilt I inserted a flat slat of wood into it. The row of hooks already on the wall worked well when I sat the slat of wood, inside my sleeve, along the hooks. The old Singer of course looks lovely sitting in front of the quilt!